Very friendly and heartfelt stuff. Clean rooms and a nice pool. Everything a good atmosphere. The breakfast is also delicious. Everything perfect, just the fan didn't really help much in the rooms. Maybe more breakfast as well, but good location and nice staff ! I had a nice stay at this hostel and I totally will go there again! The staff was superfriendly and the hostel was super tidy and clean. The atmosphere was super relaxed. In the night you either can go out with others or you can get your needed rest in the supercozy beds in the quiet rooms and in the morning you can eat the free tasty breakfast to start the day right! It's also nice just to enjoy the day at the hostel by playing ping ping with others or just chill at the pool to cool down. We really enjoyed staying in Vivo Escondido. 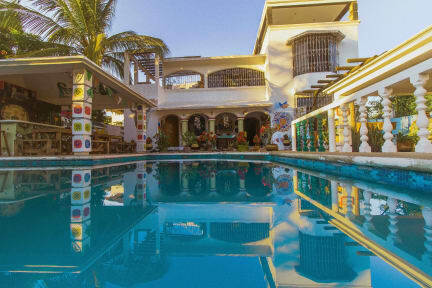 The location is very good, very close to one of the beaches, mini markets, restaurants and cafes in walking distance. The staff was very welcoming and super nice. Even when it was fully booked you could have both chats with other travelers and enjoy a book at one of the terraces. It was very clean, cheap beers and a outdoor pool. Free water and a good equipped kitchen. I highly recommend this hostel to travelers and tourists! Nothing beats the location! So close to the beach! Also if you are there at the right time, the atmosphere is great! Super relaxed vibe. We stayed there for one night. Was great for transit. Was a a good mix of party and chill areas but during the night it was quiet. Atmosphäre war seltsam. Man muss vermutlich länger dort bleiben. Zimmer war sehr staubig. Wir würden nicht noch einmal hin.